Earlier this month, my co-author Tom Toles (the Pulitzer-winning editorial cartoonist for the Washington Post) and I published our new book: The Madhouse Effect: How Climate Change Denial Is Threatening Our Planet, Destroying Our Politics, and Driving Us Crazy. Some great early reviews of the book can be found here, here, here, here, here, here, and here. Tom and I had a commentary excerpting parts of the book in yesterday's (Sunday) Washington Post. 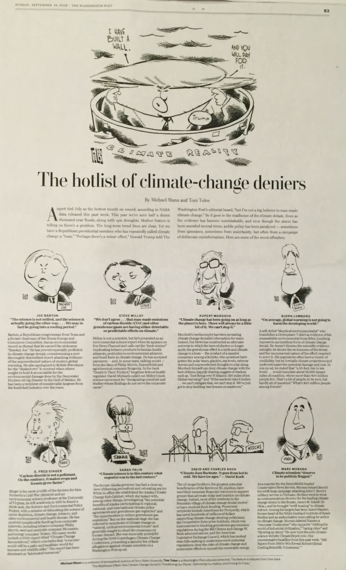 In addition to calling out the most prominent current climate change denier of them all--Donald Trump--we profile eight other leading climate change deniers in the world of politics, individuals whom--as the commentary notes--have been responsible for "clouding the climate change debate" and stalling action by participating in "a campaign of deliberate misinformation". 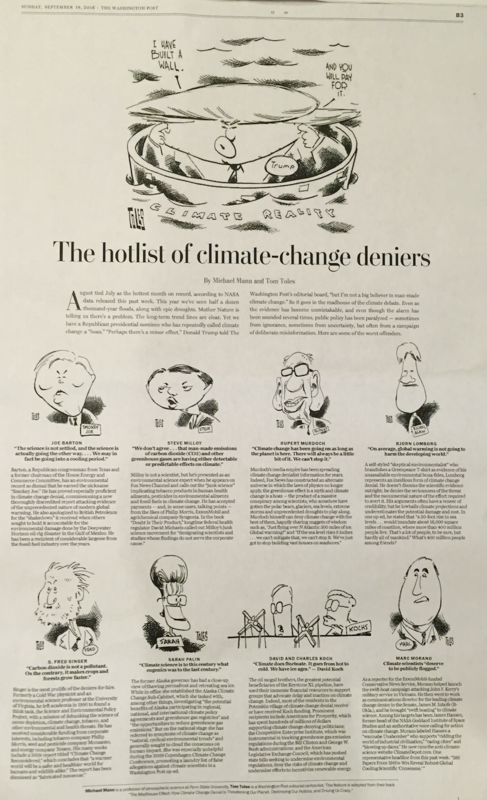 Among the Rogues Gallary of leading climate change deniers are (from left to right, top to bottom): congressman Joe Barton (R-TX), fossil fuel shill Steve Milloy, media mogul Rupert Murdoch, self-styled "Skeptical Environmentalist" Bjorn Lomborg, scientist-turned-denier-for-hire Fred Singer, the inimitable Sarah Palin, conservative funders Charles and David Koch (aka the Koch Brothers), and "swift-boat" architect Marc Morano. Consider Republican Senator James Inhofe of Oklahoma, a recipient of extensive funding over the years from the fossil fuel interests including ExxonMobil and the Koch Brothers . He is perhaps best known for declaring that climate change is the "greatest hoax ever perpetrated on the American people" and for introducing a snowball on the U.S. Senate floor as ostensible proof against global warming. Back in July 2011, Inhofe was selected as keynote speaker at the Heartland Institute's annual global warming denier "conference". He had to cancel out at the last minute however. He had grown ill swimming in a lake back in his home state of Oklahoma. The lake was suffering from an algal bloom as a result of the unprecedented heat and drought that Oklahoma experienced that summer --an event that scientists have determined was tied to climate change. Though he quipped afterward, "the environment strikes back", he was obviously undeterred in his climate change-denying ways, remaining one of the most prominent advocates for fossil fuel interests in the U.S. Senate. Which, finally, brings us to Inhofe's home-town newspaper, The Oklahoman, named the "Worst newspaper in America" by the Columbia Journalism Review (CJR) for "conformance to the right-wing political views" of the paper's owners and its "alleged racist hiring practices" among other things. And it hardly comes as a surprise that The Oklahoman, like Inhofe, is a major promoter of climate change denialism, acting as thinly veiled advocates for the fossil fuel lobby that dominates their state rather than a conduit of objective news for their readers. Stan Glantz has been called the "Ralph Nader of the anti-tobacco movement". He has led the effort to expose how tobacco interests hid the detrimental effects of their product on human health from the public, and has advocated staunchly for policies to reduce smoking. Glantz has explicitly likened the fossil fuel industry's campaign to deny the science of human-caused climate change to the earlier campaign by the tobacco industry to deny the adverse health impacts of their product. Same modus operandi, even some of the same paid deniers-for-hire (like Fred Singer listed in the Rogues Gallery above). Just last week, Glantz published a new high-profile study in the Journal of the American Medical Association (JAMA) exposing how yet another industry tried to hide the adverse health impacts of their product. Glantz and colleagues found internal documents revealing that the junk food industry paid scientists to "play down the link between sugar and heart disease and promote saturated fat as the culprit instead". So, how does The Oklahoman cover this development? You guessed it: by turning the entire matter on its head, attempting to use it as an opportunity to blame the government rather than the powerful corporate interests who were exposed by Glantz' research. And, for good measure, they attempt to use the episode to attack the science of climate change! Indeed, they attack me specifically, resurrecting untruthful climate change denier talking points about the the discredited 'climategate' affair, and the widely debunked attacks on the famous "hockey stick" curve my co-authors and I published in the late 1990s (if you want to learn the truth behind all of this, consider reading my previous book The Hockey Stick and the Climate Wars). It is possible that such a twisted viewpoint, wherein an obvious example of industry malfeasance is used to attack the scientific community, including climate scientists specifically, could arise purely from profound ignorance, rather than cynicism and malice. Yes, anything is possible. But in the end, we see that Hypocrisy: Thy Name is Truly Climate Change Denial. Thy Nickname might just be The Oklahoman. Michael Mann is Distinguished Professor of Atmospheric Science at Pennsylvania State University and author of The Hockey Stick and the Climate Wars, Dire Predictions: Understanding Climate Change, and just out in September, The Madhouse Effect, with Washington Post editorial cartoonist Tom Toles.